Posted: Friday, July 9, 2010 12:15 am |Updated: 3:36 pm, Mon Jul 12, 2010. CANYON COUNTY — For businesses like Cool Intentions, the off-season is officially over. After a slow start to summer, businesses like this Nampa-based ice cream vendor have been rejuvenated by the recent arrival of high temperatures that are expected to rise even hotter in the next few days. In a $120,000 re-purposed Chevy — “the world’s coolest ice cream truck” as co-owner Garry Siggelkow describes it — Cool Intentions has seen business pick up for its ice cream delivery and catering services. Offering exclusively Idaho-made ice cream and chilled treats, Cool Intentions has faced challenges in recent years as sales from traditional customers like on-site construction workers declined. But with a new website this year, the owners have adjusted to the times and now specialize in catering events throughout the region at places like Boise Zoo and this year’s Canyon County Fair. Other businesses with similar orientations also count on the weather forecast for sales. Big Chill Frozen Yogurt owner Jeff Henderson cites a direct correlation between the rising mercury and a rising customer base. The shop opened in late May near Edwards Cinema in Nampa, but traffic has gotten more brisk after summer’s chilly start. “Sales have definitely improved this last week and business is absolutely picking up,” Henderson said. Silver Bullet Espresso & Deli owner Angie Amstad opened her shop earlier this year above Pearson’s Twice Sold Tales in downtown Nampa. She said sales are now shifting toward chilled items like milkshakes, homemade lemonade and strawberry shortcake. Amstad said she sold about 80 chocolate-covered frozen bananas last Saturday alone. “I want to ice everything now,” Amstad said. Aside from cool treats, auto shops and pool-cleaning firms point to summer as the busiest time of the year. At Mike’s Auto Clinic, owner Mike Watkins said the arrival of high temperatures has brought an influx of business. Auto issues like malfunctioning cooling systems, broken air-conditioners and extra maintenance required for summer road trips all translate into more work for auto shops, he said. “As soon as the people with leather seats whose air conditioners aren’t working hop in the car on a hot day, that’s when they usually start to pay more attention to their car,” Watkins said. Watkins said other auto issues can be exacerbated by the heat, include worn-out tires and brakes. He also advises car owners to replace radiator hoses every four years, keep cooling systems well-serviced and check to make sure fluid levels are maintained. 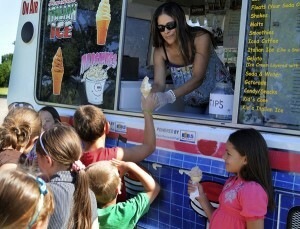 Like frozen-treat vendors, Watkins said business at the shop got off to a slower than usual start this summer.